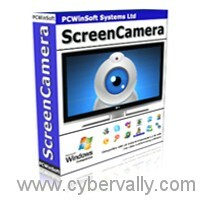 ScreenCamera is a powerful tool for Windows that allows users to stream the desktop screen along with the webcam on live video chatting sections. ScreenCamera can be used by multiple applications simultaneously and works perfectly with MSN Messenger, Yahoo Messenger, Skype, AOL, Live Messenger, PalPalk, Camfrog, AIM, Stickam, AnyWebcam, or any other video conferencing program or website. ScreenCamera can be used to provide cost-effective remote technical support, demonstrate software applications, review documents, give presentations, share photos and videos, and more. 3) Click ‘Register’ > Mark ‘Send key to my e-mail’ > Click ‘Next’ > Then enter the e-mail address you used to register > Then click ‘Send’. 4) After you receive the key you go: Click ‘Register’ > Mark ‘Enter key’ > Click ‘Next’ > Then enter the key you have received on your e-mail > Then click ‘Authenticate’.